While the Nissan Leaf is fine at putting around town on electric power and making you feel like you're saving the planet, it's not exactly what you'd call badass. But it can be if it's given the right purpose. Fighting giant monsters in Japan, for example. 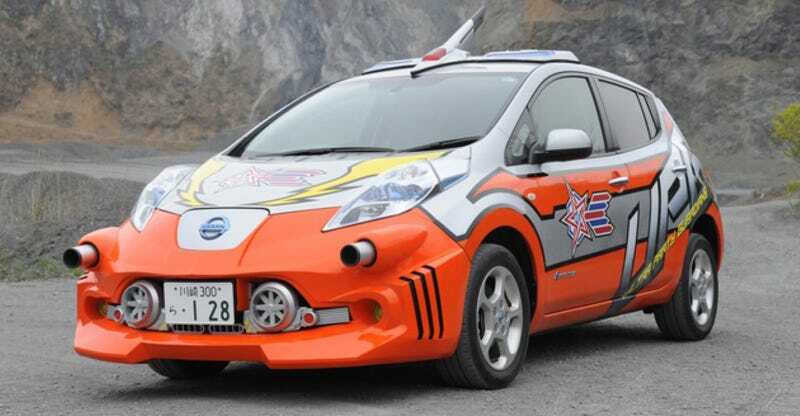 As our pals over at Green Car Reports pointed out, the electric Leaf just got an action upgrade for its starring role on the new Japanese TV show Ultraman Ginga S.
If you're not familiar with Ultraman, it's a long-running sci-fi series in Japan where a giant alien battles similarly giant evil space aliens. It's been on TV in various forms for decades over there, kind of like Doctor Who if the Doctor was as tall as a skyscraper and shot laser beams out of his head. Over the years the characters on the Ultraman shows have rolled in all sorts of crazy vehicles, including a 1958 Chrysler Imperial and, perhaps most famously, a Mazda Cosmo. The Leaf is the latest addition to the family, and here it sports a zany paint job, a body kit with cannons up front, a battle helmet antenna-thing up top, and a side decal that says "Ultra Party Guardians," which coincidentally is also the name of the EDM band Mike Ballaban and I are in. Look, the team drives an electric NV200 van too! See? Electric cars don't have to be boring. You just have to give them cannons, is all. Check out more over at Green Car Reports.